A couple of Thursdays ago, I picked up about Shadow Cabinet #0, which is basically a massive Milestone Universe cast party, with all of the major characters warring against each other to save Dakota. I already reviewed the comic here and introduced a couple of our heroes – Static, Icon, Rocket, and Hardware. Let’s meet some more of them… how about some of the ladies?! A corporate translator by day, by night Kahina Eskandari becomes Iron Butterfly, the field commander of Dakota’s illustrious crime fighting crew the Shadow Cabinet. She can manipulate and control metal, down to its molecular structure, moving or reshaping it and even able to sense its particular properties. Donning iron armor in battle, complete with two massive iron wings, Iron Butterfly can fly by levitating herself in her metal armor. She’s also a mean swordsman and tactical genius. We first meet her in Hardware #11 (1993) when she appears and offers Hardware membership in the Shadow Cabinet. Her origins are slightly murky, but we do know that she’s Palestinian (one of few Palestinian superheroes in comics!) and possibly grew up in Iran. Her entire family was murdered when she was a child. Vowing revenge, she took up with the Shadow Cabinet and came around to the vision of global justice preached by Dharma, the Cabinet’s omniscient leader. She later fell in love with Dharma. Iota is awesome. She’s a supergenius Australian physicist and inventor, who, after an accident in her lab, gained the ability to alter her own physical size and the size of any nearby object at will. She can shrink herself and nearby objects down to microscopic size. Her husband was supposedly killed in this accident, but it was later discovered that he was sent to an alternate dimension where he became corrupted and installed himself as a despot. 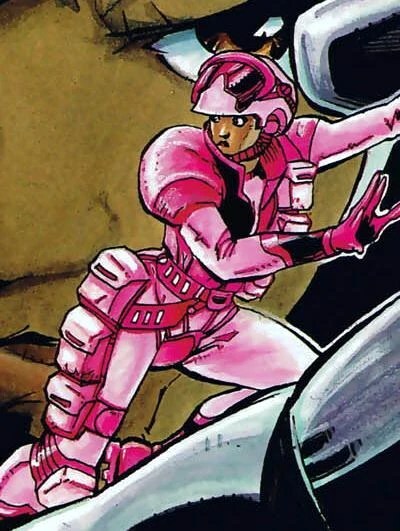 However, Iota isn’t all goody-goody herself, she has something of a kleptomania problem, stealing and collection various items like helicopters, jets, and military vehicles, which she shrinks down to size. She definitely doesn’t need to steal, because she’s super loaded, but she prides herself on her thieving. She carries many of these shrunken stolen items in battle, so that she can restore them to full-size and wield them as weapons or use them to rescue herself or others. Not all of her weapons are stolen, many of them are her own invention. She usually rocks a jetpack too (unclear whether she stole it or not). 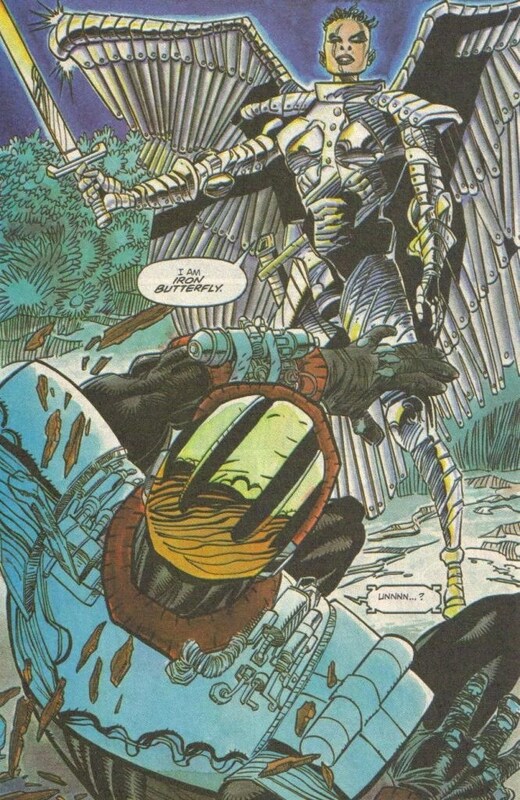 She first appeared in Blood Syndicate #10 (1994). Donner has superhuman strength and is invulnerable to most physical attacks. Born Gerri Brauer, the German granddaughter of a Nazi geneticist, her superpowers may be due to some early tampering by her grandfather. When she was young, she was involved in Neo-Nazi gangs, but later saw the error of this and dedicated her life to justice, joining the Shadow Cabinet, where she fought alongside her now girlfriend Blitzen (aka Valerie Kameya). When the Shadow Cabinet’s leader Dharma tried to imprison the Cabinet’s members, she broke them out and formed a new group called Heroes. She first appeared in Icon #9 (1994) when she fights alongside Blitzen and Icon to defeat the villain Holocaust who had tried to recruit Icon’s sidekick Rocket to join the villainous Star Chamber group. We don’t know much about Blitzen, but we do know that she was once a scientist named Valerie Kameya, and she developed a serum that endowed her with superhuman speed. The serum allows her to not only move but also to think supremely fast, making her a force to reckon with in battle. After joining the Shadow Cabinet she fell in love with Donner and the two became one of the first open lesbian couples in comics. She’s known for being brutally honest and like her girlfriend, she has a past of not-so-heroic deeds. 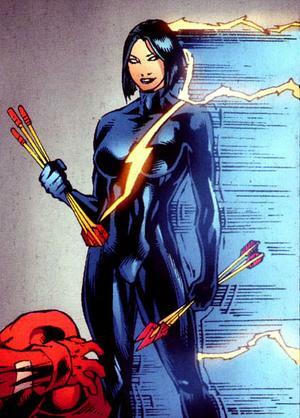 She first appeared in Icon #9 (1994) alongside Donner. She also joined Donner in forming the new group Heroes. Previous Previous post: What if The Doctor Was A Black Time *Lady*? : Is It Time For Doctor Who To Get a Whole New Look? Great post! Shadow Cabinet was my favorite comic when it was coming out. A very forward-thinking comic in many ways! Thanks! Definitely was way ahead of it’s time. Bet it would get mad progressive love these days! Maybe even a kickstarter…. Probably, but the characters belong to DC, so that’s moot. Womp. Forgot about that. And I guess the New 52 Static didn’t get much love… Double womp. But, good thing we got incredible artists like yourself fillin’ the gap (fangirl aside: loved your pieces in Black Comix)! We could certainly use more fangirls! Not sure if that was before or after the whole “New 52” thing. It would help if J.P. Leon was drawing it. The original writers (Dwayne McDuffie and R Washington III) have both passed, but maybe they could snag Matt Wayne to return to the title? It has a lot of blah blah about Shadow Cabinet that you might appreciate. Milestone Comics in general were ahead of the time. Sadly, 20 years later, the rest of the industry is STILL playing catch-up. Thank you for an exceptional article on an oft-neglected, extremely monumental piece of Sequential literary history. Thank *you*. I never get tired of talking about/shouting-out/reading Milestone comics. Here’s hoping more and more people come to know about the phenomenally progressive work they put out.